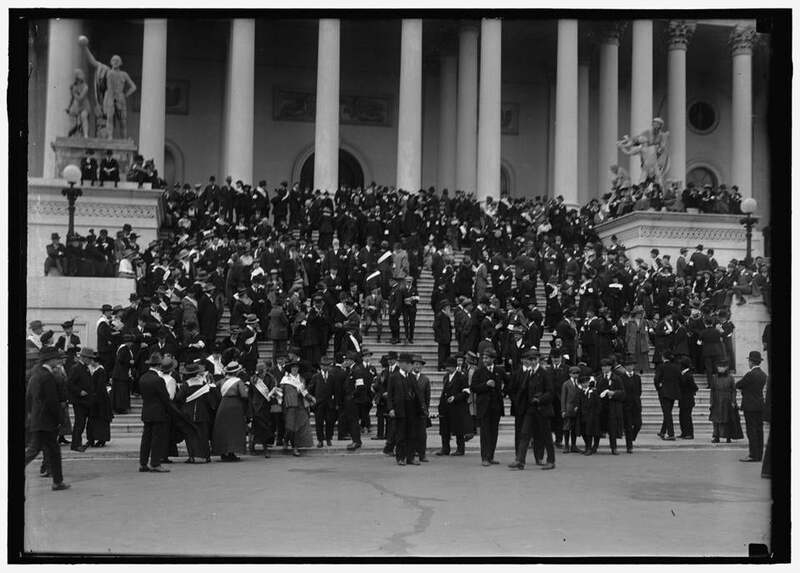 Anitwar protestors on the steps of the US Capitol. Of all the momentousmonths in history — April 1775 (Lexington and Concord), April 1865 (Appomattox and the assassination of Abraham Lincoln), November 1963 (the assassinations of Ngo Dinh Diem in Saigon and John F. Kennedy in Dallas) — March 1917 still stands out. It was the month when Russians took arms against their own government and when Americans girded to take arms against Germany in World War I. It is not too much to say that the month launched the world on a trajectory it would follow for the rest of the 20th century, the very argument Will Englund successfully makes in this new fast-paced history. A mere glance at the principals of “March 1917’’ suggests big things loom: Woodrow Wilson, outraged and idealistic; V.I. Lenin, steely and determined; Theodore Roosevelt, militant and militaristic; even Jeanette Rankin, Montana pacifist, first female member of Congress, and the only lawmaker who would vote against American involvement in both world wars. The two nations that Alexis de Toqueville predicted in 1835 would dominate world affairs were on the precipice of change. Russia was in despair; food in short supply; political unrest spreading. America had felt safe behind its ocean moat, but its professor-president was confounded by Germany’s unrestricted submarine warfare and forced to abandon the isolationism that had not kept America isolated from peril. The month, and the war that followed, changed the world, wiping venerable empires from the map, propelling Russia into Soviet communism (and a contempt for the people in whose interest the revolution was prosecuted) and transforming the United States into an international force with a population suddenly exposed to the world and to diverse views on life, politics, and culture. It is true that Wilson was succeeded by a president, Warren G. Harding of Ohio, who brayed about “normalcy,’’ but in fact Wilson and the war created a new normal for the United States, one of global engagement. And it sealed in the American consciousness an important principle that guides us still. “World War I gave rise to the idea that it was better to fight the enemy abroad than wait for him to attack at home,’’ Englund writes in his last paragraph, a passage that alone justifies the 322 pages that precede it. “The lesson of 1917 seemed to be that America had an obligation . . . to defend democratic values wherever they were threatened.’’ Silentlyunderlying that, of course, is recognition that isolationism would not longer be, if it ever really was, an option for America — an idea we still struggle with, especially of late.